Beef Barley Soup is incredibly easy and so delicious! Loaded with nutritious veggies, tender beef and plump barley, it’s a complete meal in a bowl! This homemade beef barley soup can be made ahead of time and freezes well making it the perfect family dinner! 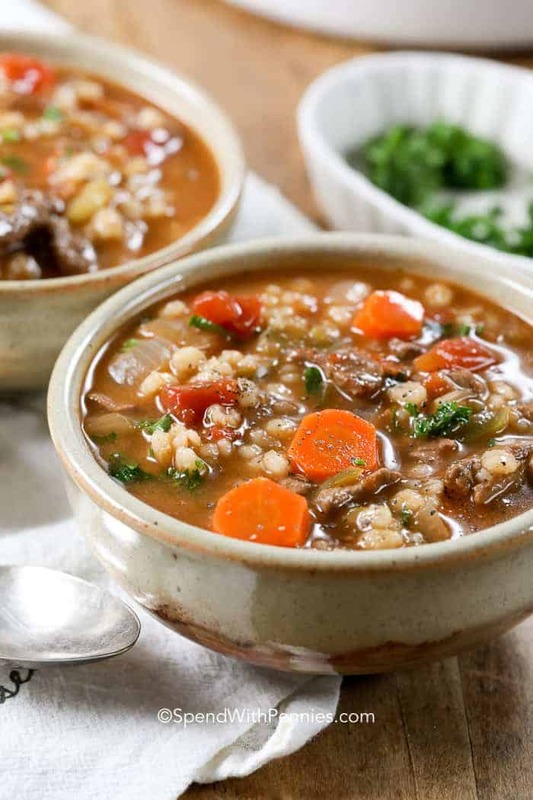 All of my favorite soups are fully loaded with goodies including veggies and grains, this Beef Barley Soup definitely fits the bill! It is a rich and hearty barley soup that leaves you completely satisfied and warms every inch of your body! It screams comfort food, like mom used to make and is perfect served up with a side of buttermilk biscuits and a side salad! 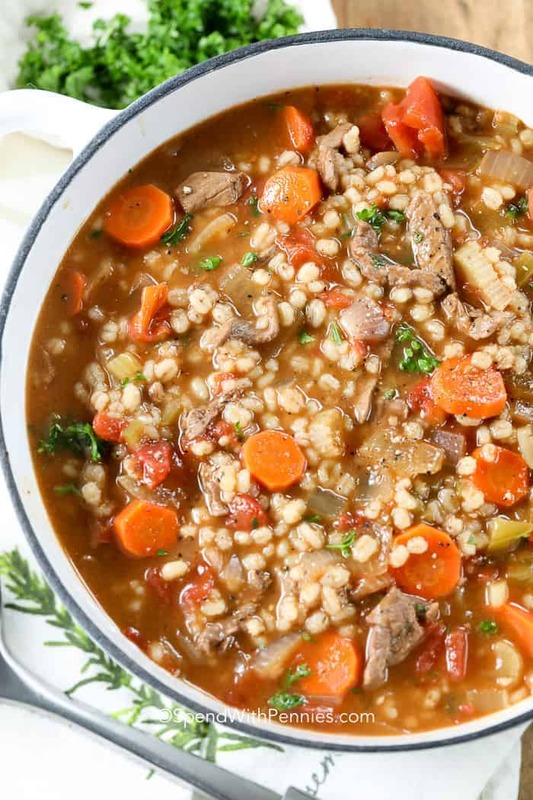 While the list of ingredients may seem long, this Beef and Barley soup is really easy to make. I start out by cooking garlic and onions just until softened. All of the remaining ingredients are simply added to the pot and simmered until tender. I use homemade stock whenever possible for the best flavor. 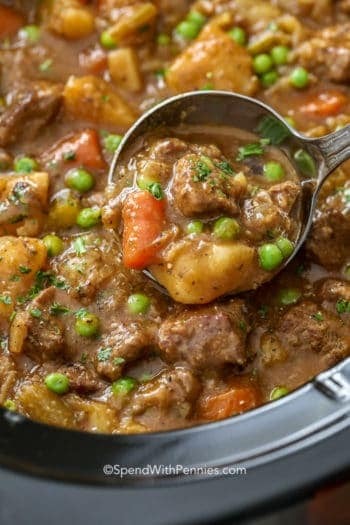 What is the Best Beef for soup? This recipe calls for cooked beef. You can use any kind of leftover beef for this beef barley soup including pot roast, leftover steak or roast beef. If you don’t have cooked beef, you can cook your own. I use either flank steak (sliced against the grain) or cubed chuck. If you’d prefer, you can most certainly substitute cooked hamburger in this barley soup recipe. If making a ground beef barley soup, you’ll want to brown the beef with the onions and drain any fat. One of the main components this recipe is barley. Barley is a grain that is very similar in size and texture of brown rice. There are several different types of barley but the most common is pearl barley which is used in this recipe. 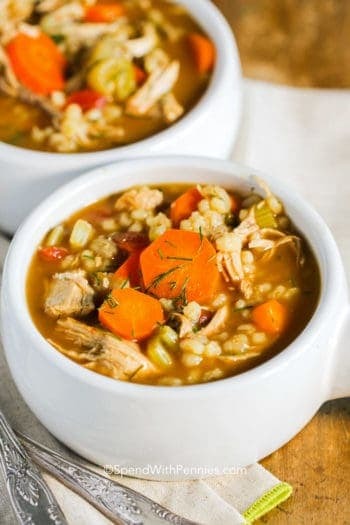 I use it frequently in place of rice and pasta in many soup recipes, perfect in my Chicken Barley Soup! With it’s slightly nutty flavour and interesting texture, it will sure to be a hit in your next homemade soup! 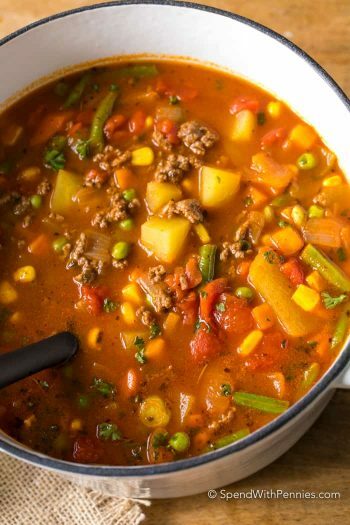 Try adding it to my Easy Hamburger Soup or in place of the noodles in my Turkey Noodle Soup! Your family will love the change! Cooking the same things all of the time can leave any home chef in a bit of a meal-making rut. The addition of vegetables makes this a great and healthy choice and keeps is relatively low in calories. Incorporating new ideas, flavors and textures helps to keep things interesting in the kitchen! 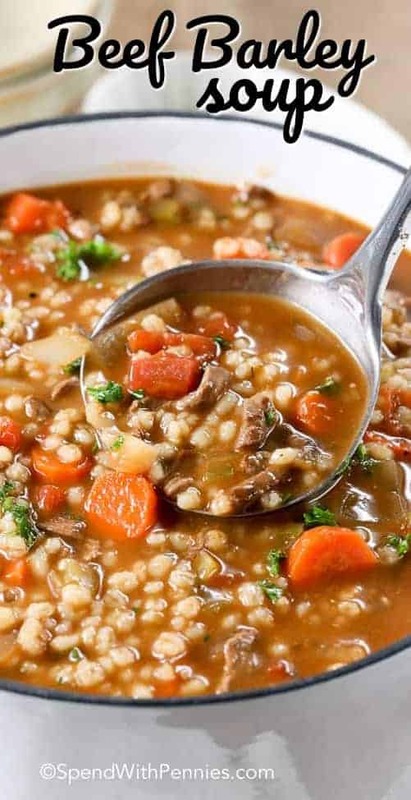 This Old Fashioned Beef Barley Soup is traditional soup that has not lost it’s lustre! We serve this alongside our favorite biscuits or 30 Minute Dinner Rolls with a fresh garden salad for a perfect meal! 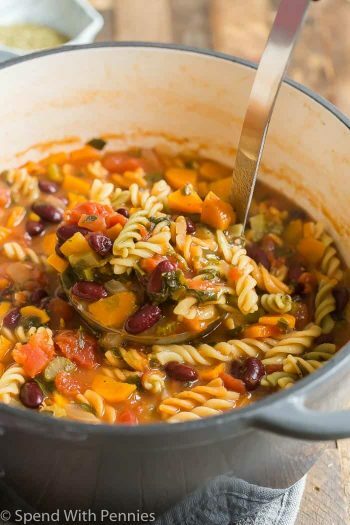 Make a large pot and freeze smaller portions to enjoy later – it freezes amazing and you will love how convenient it is to microwave or reheat on the stove! 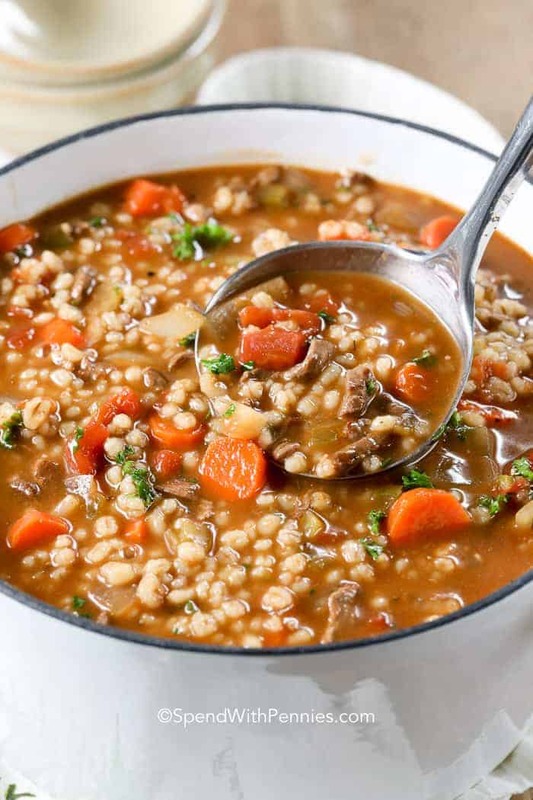 This homemade beef barley soup is loaded with nutritious veggies, tender beef and plump barley. It’s a complete meal in a bowl! Cook onions and garlic in oil over medium heat until softened. Soup may thicken upon cooling, add extra broth (or water) to reach desired consistency. Made this after work tonight and it is delicious. I didn’t add green peppers because I’m not a fan. I added mushrooms and it was fantastic. Thank you for sharing this easy and delicious recipe! Adding mushrooms sounds like a delicious idea Melissa! I am glad you enjoyed this soup recipe! Hi Wendy, I am so glad you enjoyed the Beef Barley soup! I want to make this Sunday, can I make the beef with the onion and garlic together? I am going to use ground beef. Heather, I have only made them as written, but think it would be fine. What a rich and filling soup. I made this today with some of my homemade bone broth. I didn’t have a greeen pepper but I did have fresh mushrooms so I sliced and cooked them with the onion. I had second thoughts about the diced tomatoes since my family often gets stomach upsets from tomatoes. So after I added them, I scooped most of them out with a slotted spoon–crazy, right! I used hamburger for the beef component. I just tasted the finished product and it is wonderful! The perfect soup for a day like today–snowing and blowing. Thank you for this wonderful recipe. I’ll be making it again! I am so glad you enjoyed the recipe Ann! I love this soup on snowy days too. 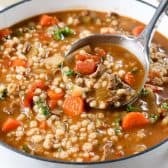 Mushrooms sounds like such a yummy addition I am going to try this myself the next time I prepare this Beef barley soup! Hi Holly, I made the Homemade Beef and Barely soup today and I must tell you that the soup came out better than I thought. In fact it was very very good. Both my dad and I loved it. Thank you for the recipe. We really enjoyed it. Hey Holly. Great recipe! How big of a serving size is the nutritional information based off of? Thanks! This recipe makes 8 servings and Nutritional information is based on 1/8 of the recipe. Enjoy Anthony! This is the perfect soup for a cold winter evening! It was simple to put together and smelled divine while it was simmering. I didn’t have celery, so I used some zucchini and then added a few mushrooms. YUMMMMMMMY! You end up with a large pot of soup. So, be prepared to serve a crowd or have some tasty leftovers for lunch the next day. This will be on my list of go-to soups for chilly winter days. Great additions Candy. Thank you for sharing! OMG! It was so good! I started with beef soup bones and cooked in instant pot for an hour. I got some yummy broth and plenty of meat. I added one or two more carrots and the entire green pepper for extra veggies! Delicious! So glad you loved it, I bet the homemade broth made it even better! Outstanding soup! Perfect for a cold winter day. Thank you for sharing! So glad you loved it Sheri! I made the beef and barley with hamburger and have to say I like it better than my vegetable soup I make. So glad you loved it Diane! Hopefully they do too! OMG, this soup is awesome!,..my wife made it for me from her blog and it is delicious, thank you Holly! So glad you love this delicious soup Ken! Excellent! Easy to make and delicious. Thank you Michele! So glad to hear you love the soup! I have made this twice now and it is delicious and a family favorite . I’ve pretty much made it “as is” but this time I only added 1/2 a packet of the gravy mix. It was great with the full packet as well; I think I like it the subtlety of 1/2 better. 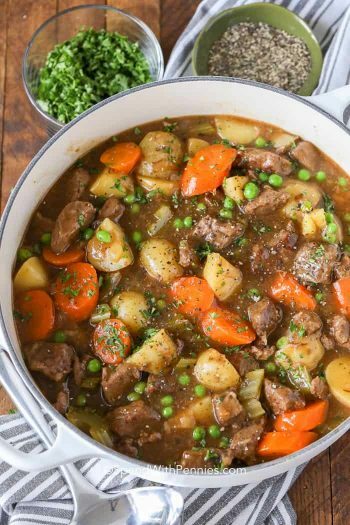 Yummy and hearty! So glad you loved it Susan, it’s one of our favorites too! Holly wondering your thoughts on subbing apple cider for wine? Can’t wait to make it. Thank you for sharing. I haven’t tried it so I can’t say for sure. Perhaps just start with 1 tablespoon and see how it works out for you! Let us know how it goes! This soup is yummy. I followed the advice on a comment and added golden beet and kale. Adding this to the rotation. Thanks for the recipe! Yummy addition, glad you enjoyed it Andrew! Is the 2/3 cup barley cooked or dry. This is the dry measure. extra nutrition. I give the recipe a 5. I absolutely love your additions, thank you for sharing! Is it possible to not put the green pepper in? If you aren’t a fan of green peppers, you can omit them. I used about 1.3 lbs. of chuck, browned it in the soup pot, then deglazed the pot with about 1/3 cup of red wine, garlic, and onion. This added a nice depth to the beef flavor. Also left out the pepper. Otherwise, I followed the recipe as written. It was very tasty. So glad you enjoyed this recipe Jason! 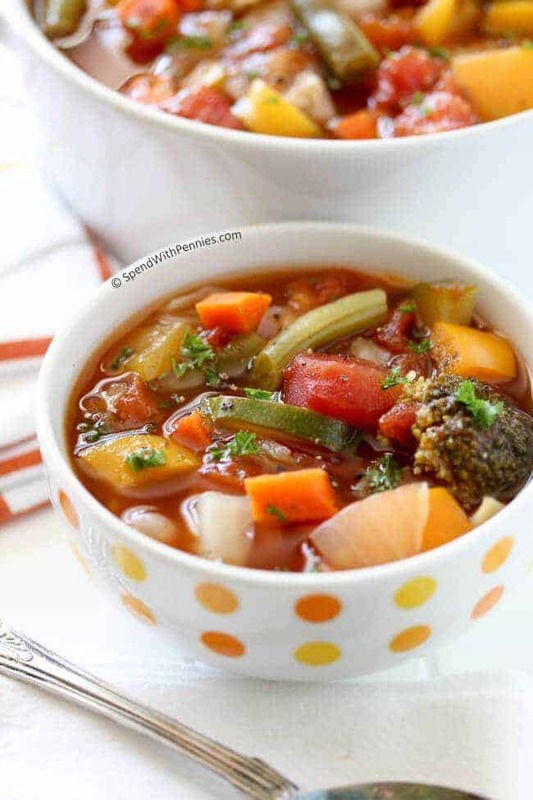 Very delicious soup and very easy to make. I made the recipe as instructed but did omit the wine. Next time I make it, I will use a different kind of beef that is more fatty like a chuck. I used top round this time which I thought was too lean. Glad to hear you love the soup Pam! This soup was delicious! I added a few green beans, extra thyme, and omitted the gravy mix. We will be making thus again, my daughter and husband loved it! I’m so glad your family loved it! This was one of 7 soup/chowders I made for my annual “Sip and Soup Holiday Party” This soup was very popular. I roast a small chuck roast with root vegetables and then made gravy from the broth and vegetables. Everyone asked for the recipe . I will be making this thru out the winter season. Is there a substitute for the beef gravey mix??? The soup sounds wonderful!!! Can’t wait to try it!!! You could leave out the brown gravy mix or use beef bouillon. Do you add the beef bouillon as is or do you mix it with water? I would use it as is if adding it in place of the gravy mix. Awesome! Hubby can be a soup snob, but not this time! Yum yum!!! Yay! Glad your hubby enjoyed the soup Deb. I just made this and ate two bowls! It’s very delicious. I didn’t use wine in it, and omitted the bell pepper. Other than that, I followed the recipe. 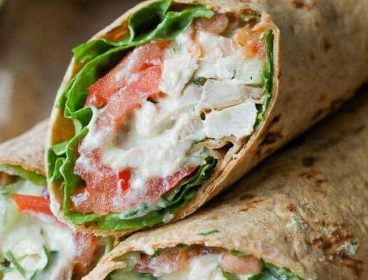 It’s easy, nutritious, and delish! Thanks for this yummy recipe. I’ll definitely be making it again. I have a London broil steak in my freezer will that work for the beef in this recipe? Any thoughts on if it would come out tender? 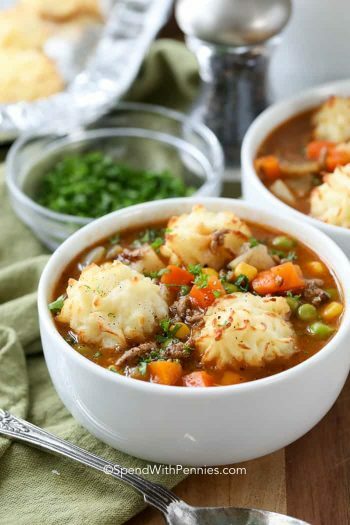 Beef and Barley soup is one of my favorite’s!! Thanks for the recipe! This recipe asks for cooked beef. Cook up your London broil in your usual way, and it should work just fine! Enjoy Tammy! Oh my! This is good!!! I made this on 14 Aug, and wow! And from my wife, wow! The cooking time is 100% spot on, simmering a bit more for a thicker soup. I did make some deviations but did not detract from the recipe. Used ground beef (1 lb), and cutting the carrot in a Japanese style, and no celery, so some celery seed did the trick, and to add a bit to the soup, added some pressure cooked long beans (like a green bean but 12-20 inches long). Other steps listed, used, and perfect! Thank you for a wonderful recipe, and will be a favorite here! Worthy of 10 stars!!! Thank you Lee, so glad you enjoyed the soup! You’re right, it’s easy to change it up with what you have on hand. Thanks for stopping by! 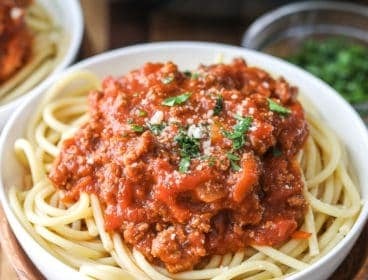 I recently found barley here where I live, and I will make this with ground beef (it is local beef, so best ground), I will return back with a rating and comment, thank you, Holly, for the great sounding recipe. So glad you love the soup Flo! 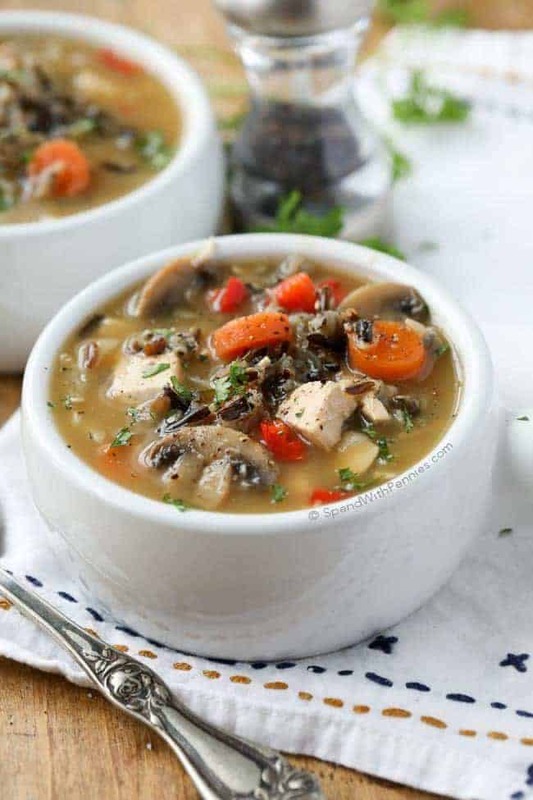 I’d love to make this soup in a slow cooker. Has anyone tried it? Can you share your directions and the final flavor? Thanks. So glad you loved it Patti! Was so easy to make, and my husband loved it, especially with fresh bread rolls! This soup was excellent! I used Sherry instead of red wine but everything else exactly. Making it again today. You can use leftover cooked roast beef or even leftover steak. If you only have raw beef, you’ll want to cook it with a little bit of olive oil, salt and pepper until browned. On this cold rainy day I made this delicious beef barley soup, To save time I used low sodium organic beef stock, I omitted the pkg of beef gravy, added a marrow bone, and mushrooms to this easy recipe! It is delicious! I used leftover pork tenderloin. Im sure this will be great. What to do with left over pot roast? After using in this recipe I can’t wait to make another pot roast! It is delicious. I didn’t have the pkg of gravy in the recipe so I just added the broth from the roast. So happy to hear you love this recipe Dona! The family really like this! Enjoyed this soup for lunch today. Especially liked the beefy taste of the broth. Likely the package of beef gravy mix made the difference. I wonder out loud if I add a package of chicken soup gravy mix to a chicken soup recipe if the results would be the same. The barley in the soup in the picture is way under cooked. It takes a long time to cook barley. This would be the kind of chewy stick to your teeth meal Cook it longer. It was definitely not undercooked. It was perfectly tender, this is pearl barley which cooks in about 25 minutes. Hulled barley takes at least 40 minutes. Amazing recipe. I let ALL my veggies sweat a little bit not just onions and garlic. And it still was amazing! This soup was amazing! I made it tonight with homemade bone broth I had simmering all day. I used beef cubes and cooked them with 2 cups of bone broth in my instant pot, first sautéing them then cooking them for 75 minutes on manual. The seasonings were perfect. Will freeze the leftovers. Restaurant quality soup recipe. Thanks so much! I am so glad that you enjoyed this recipe Pam! I haven’t tried this in the slow cooker but I’m sure it would work. I would likely cook on low about 8 hours to make sure the barley is cooked through. Please let us know how it goes! I bet this would be great with deer meat also !!! Do you have a recipe for vegetarian barley soup? I don’t have a recipe for a vegetarian barley soup. Try this. I think it’s pretty good! I use chicken broth or vegetable broth in place of the water.